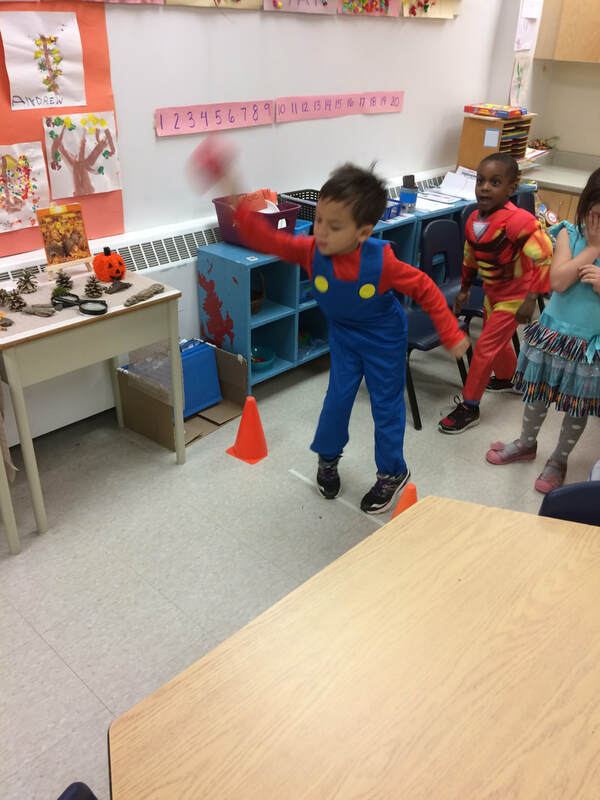 WHAT'S HAPPENING IN OUR CLASSROOM? 1. Colour the Leaf: Students would pick a leaf out of a jar that had dots on it. They would then count the number of dots and colour in the leaf with that number. ​2. 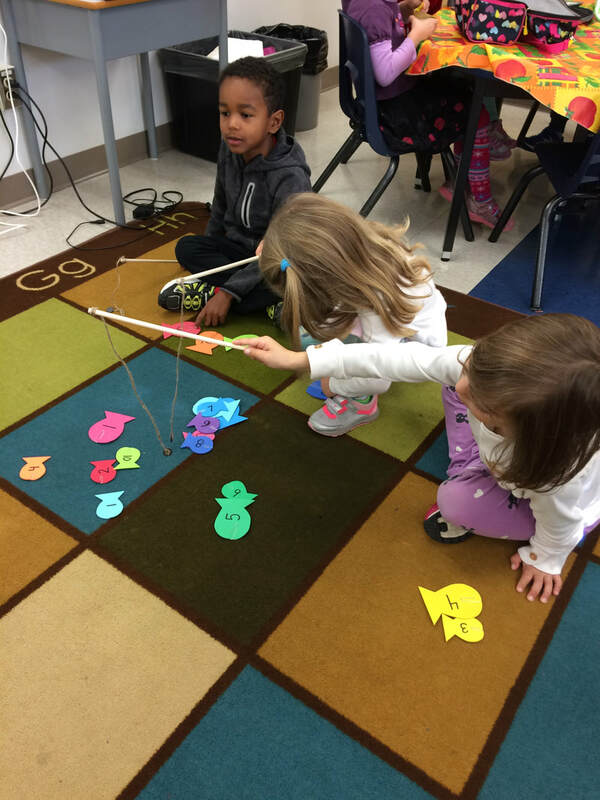 Number Fishing Game: Students would use their fishing rods to catch fish numbers! 3. 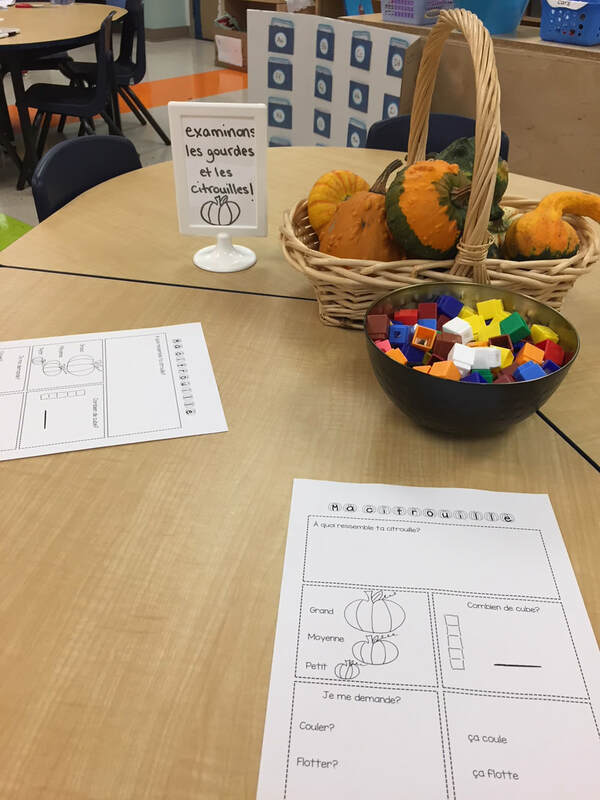 Halloween Roll and Stamp: Students would roll a dice and whatever number they rolled they would use their Halloween stamp to stamp that number. 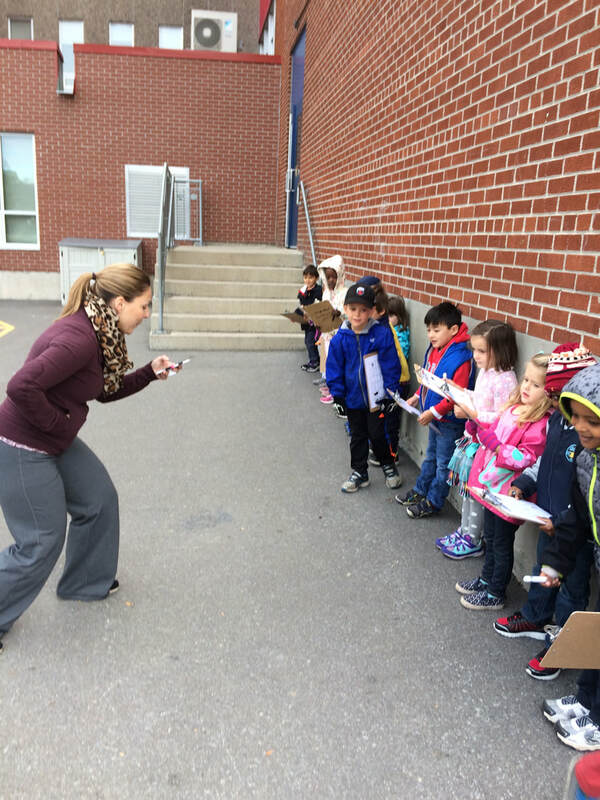 In Language this month, we continued to explore our letters and their sounds. 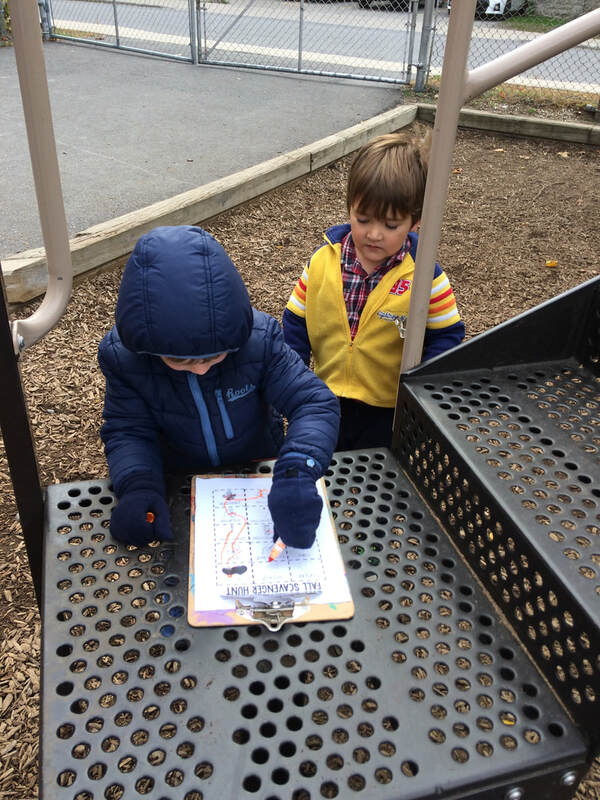 Students had lots of opportunities to match letters with pictures, write letters on whiteboards/chalk boards, and practice writing their names. 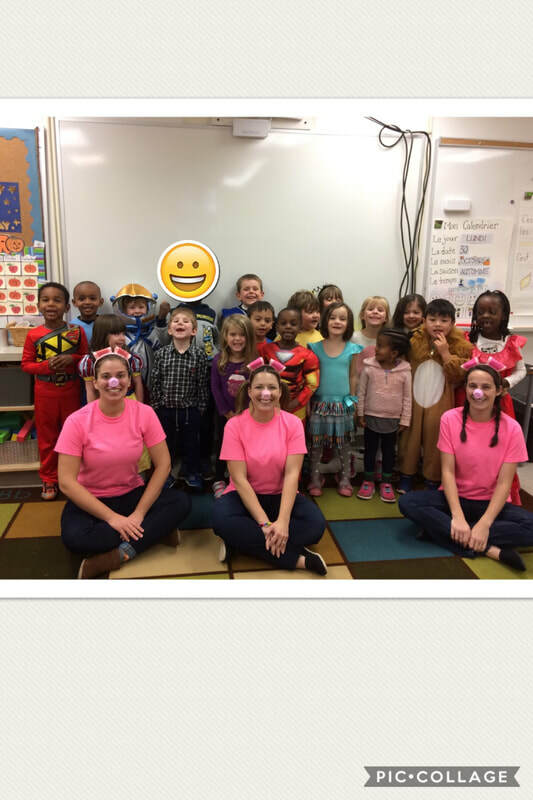 Ask your child to sing you our alphabet song! We have learned all the letters from A to Z! 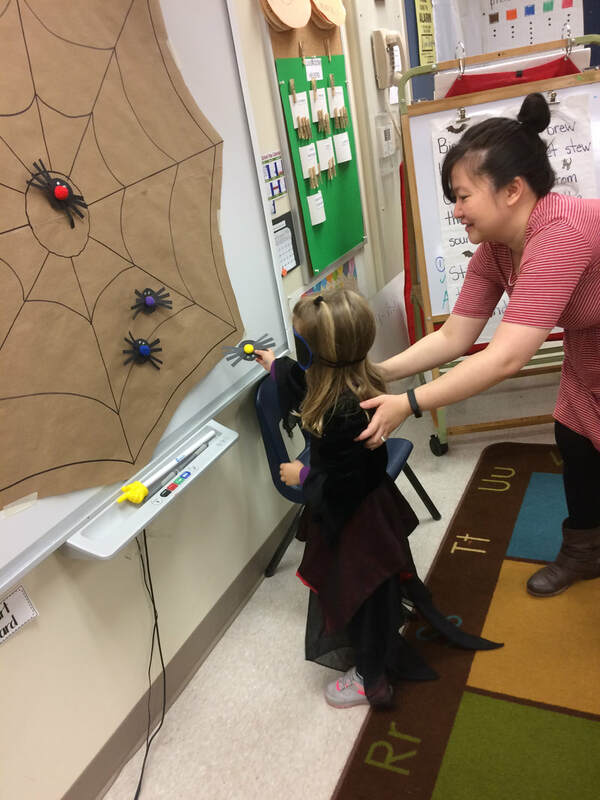 Or try asking them to sing "C'est l'Automne" or name some spooky French Halloween vocabulary! 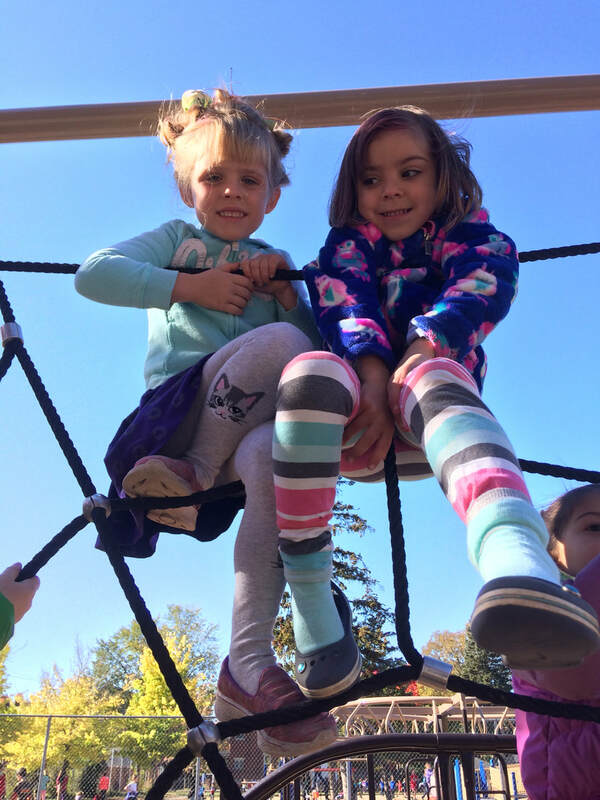 October was a full month with lots of sensory activities and lots of exploration. 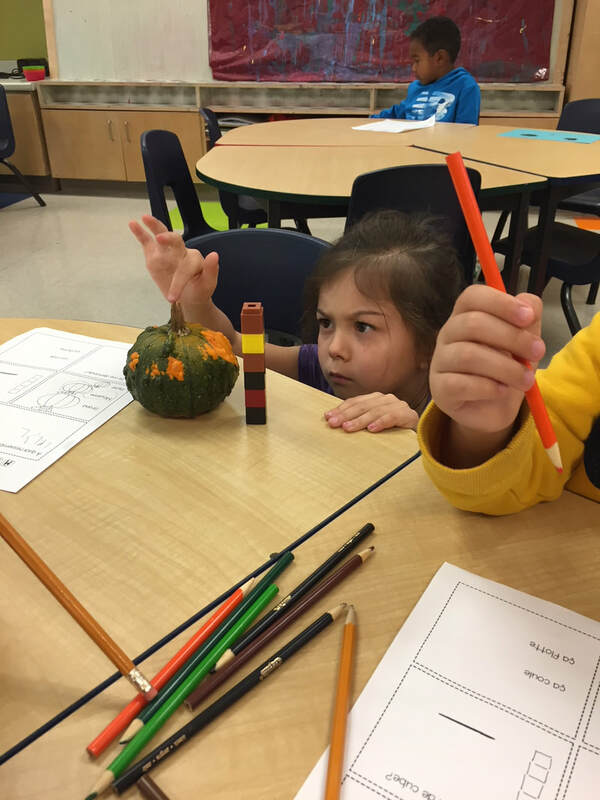 We explored a lot about fall! What do you prefer? Green or red apple? 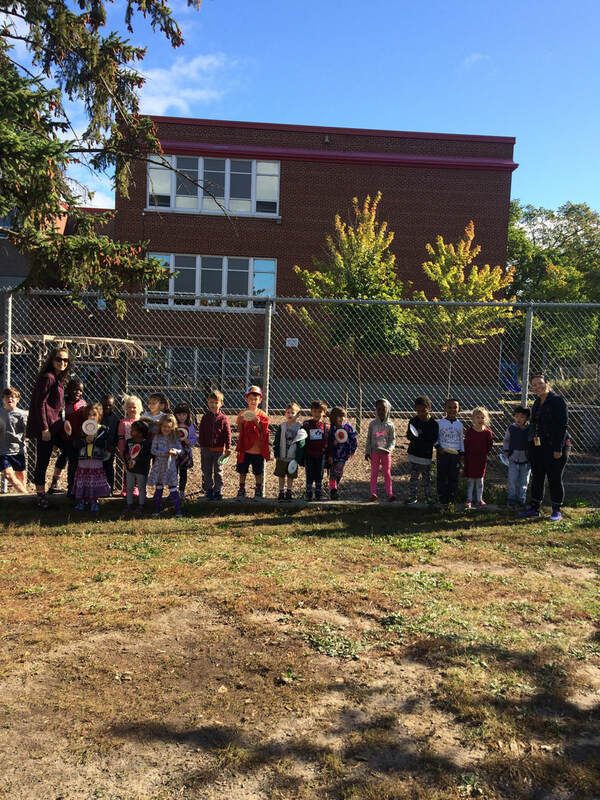 : We had a class taste test and then a class vote. Red apples are our favorite! 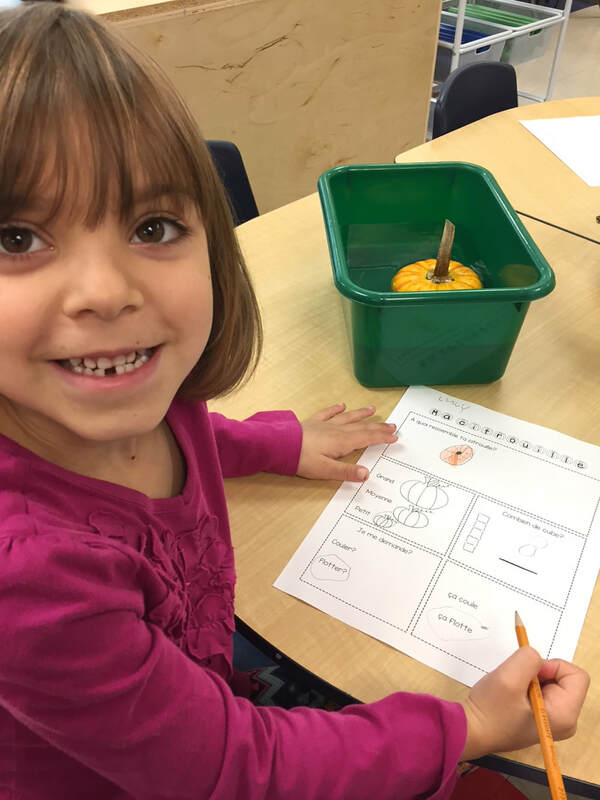 Pumpkin discovery: We measured our pumpkins and gourds, estimated their size and then made predictions about whether or not they would float in water. 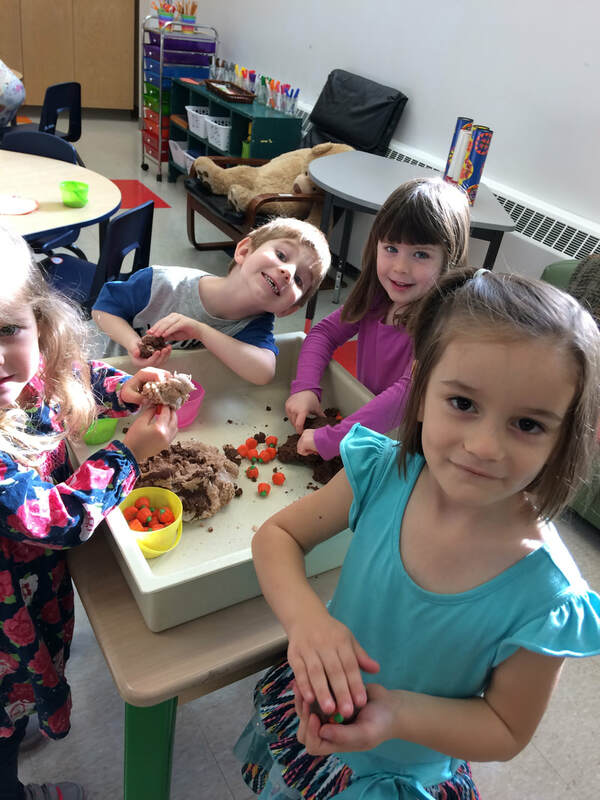 Applesauce: As a class we made delicious, homemade apple sauce. 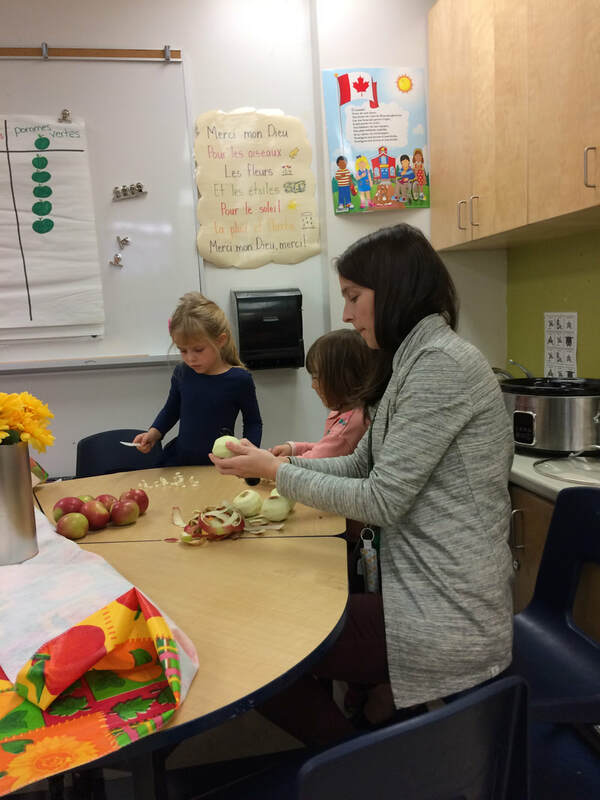 We peeled and cut the apples, mixed all the ingredients in the slow cooker, watched it cook, and then FINALLY, got to eat it! 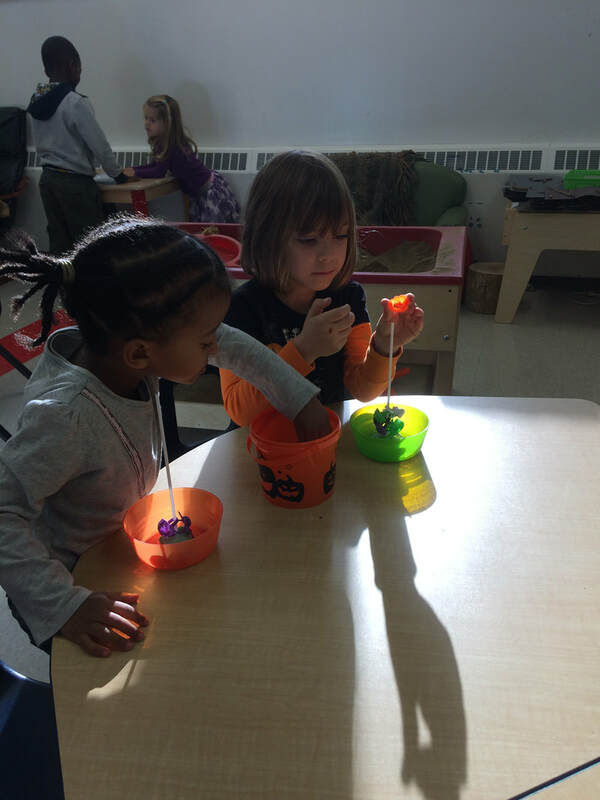 Fun Sensory Activities: Throughout the month, we explored different sensory activities that were based on Halloween! 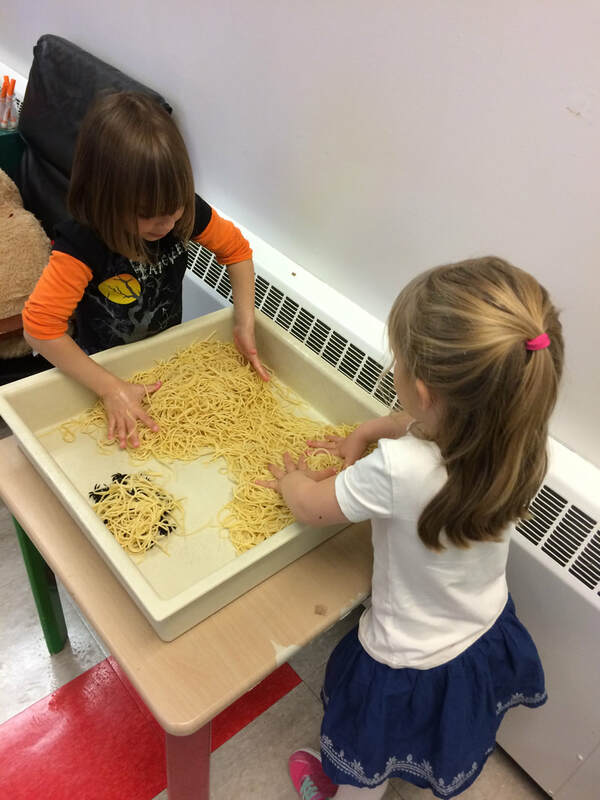 Activities like sorting Halloween rings, making a pumpkin patch with hot chocolate playdough, growing a pumpkin and batch sponge, playing with spiders and noodles, and much much more! 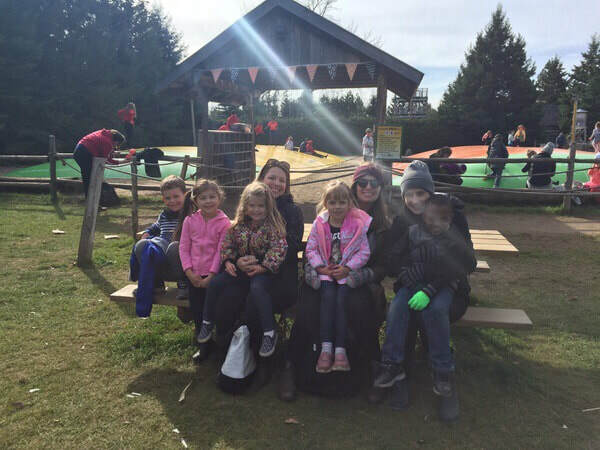 As everyone is awhere, we had a wonderful trip to Saunder’s Farm! 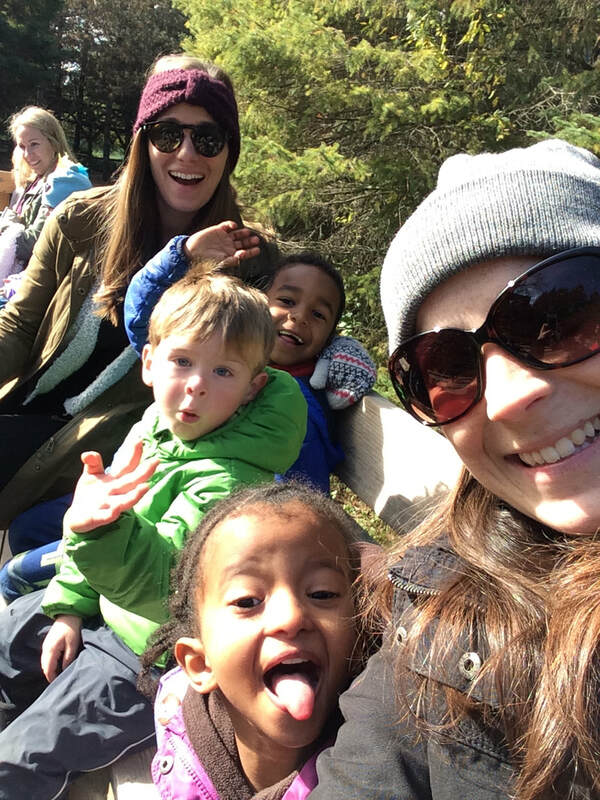 It was a beautiful day and we had so much fun! Here some pictures from the day! 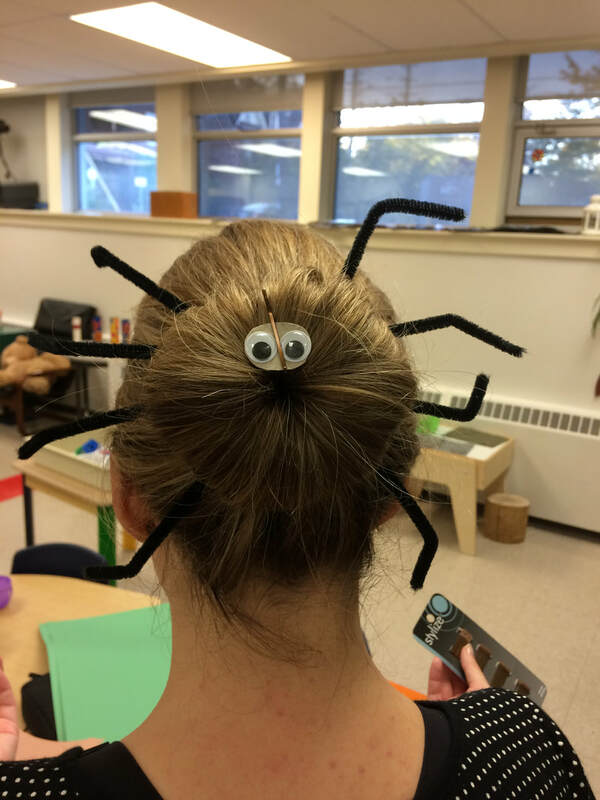 One day this month was crazy hair day to raise money for United Way. Some of us got very creative! 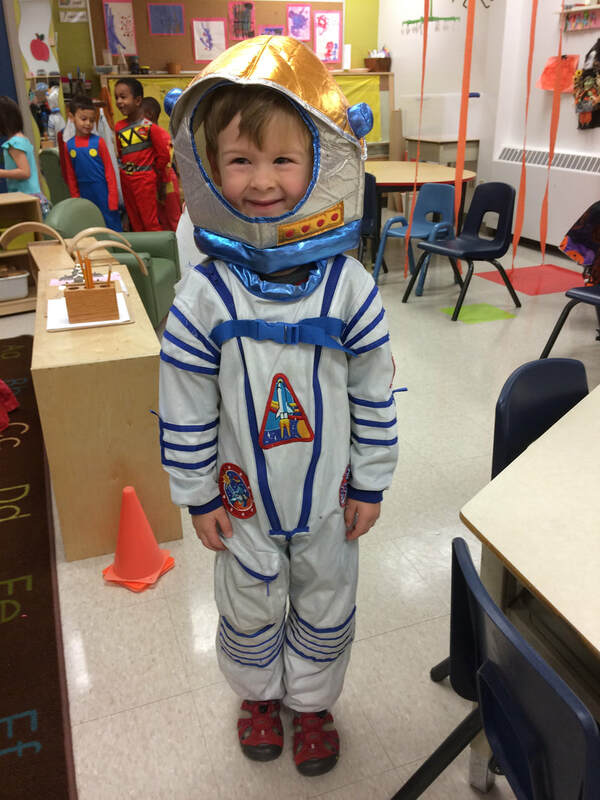 Halloween was a very exciting day in KP3. 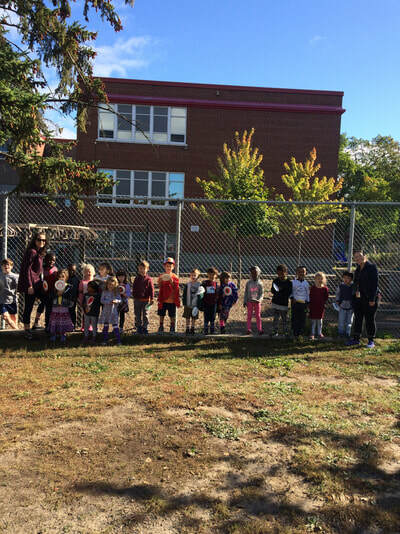 We worked with the other two kindergarten classrooms and got to participate in many different activities. 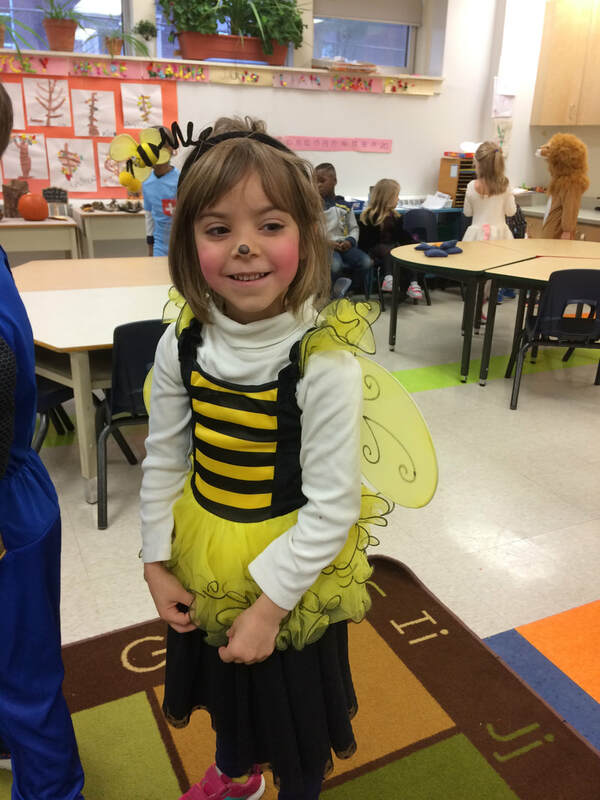 Some of us had wonderful costumes and had a fun day! 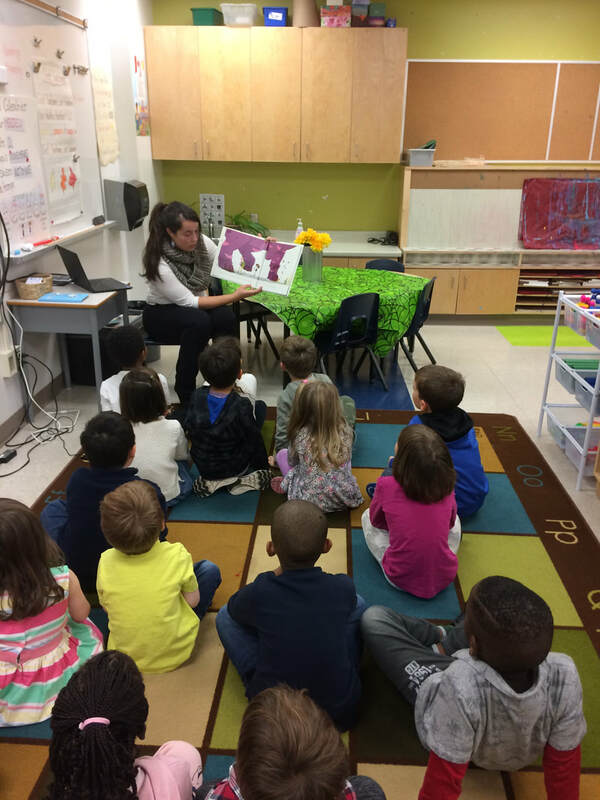 In October, we started having some guest readers in our class. The students receive clues about who the guest reader would be and they would try and guess who would be coming to read to us. 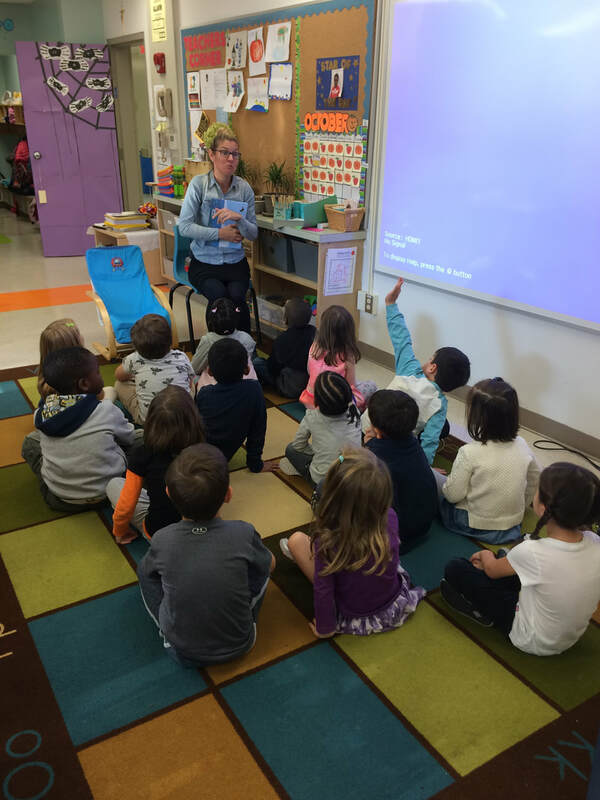 Our first guest reader was Mrs. Hunter (our resource teacher) and the second guest reader was Ms. Solymar’s sister, Karina! 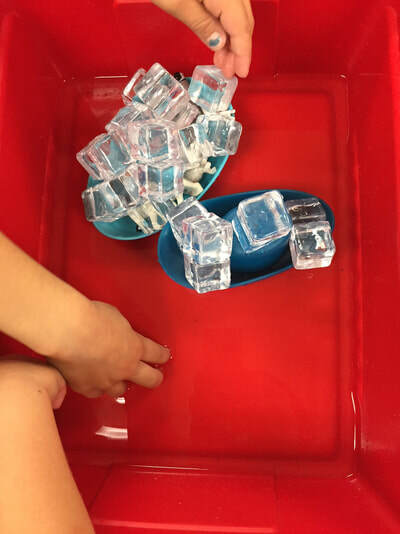 Fill Up My Cup - Students roll a dice and whatever number they role they put that many cubes into their cup. The first person to fill up their cup wins! Number Memory Game - Students would play a game of memory where the cards were pictures and numbers. They would have to flip over the card that showed the appropriate number with the appropriate picture. If they got a pair they got to keep it! 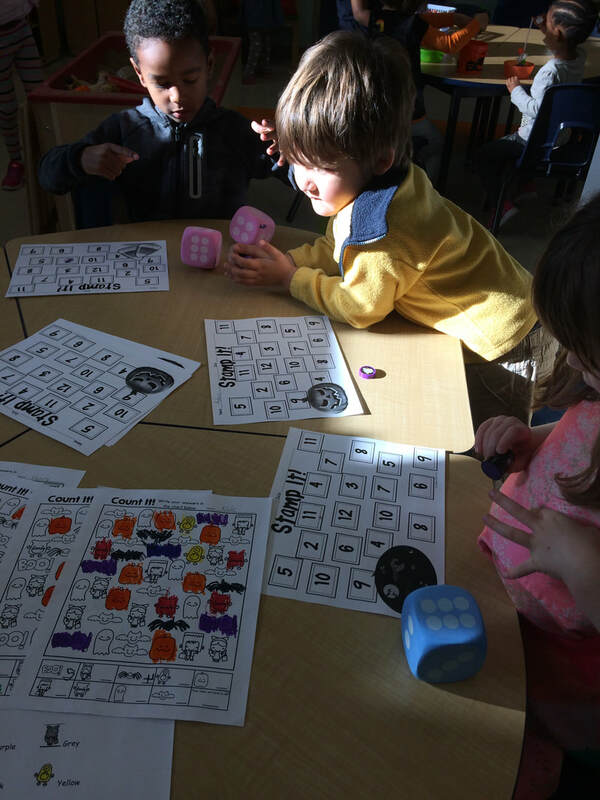 Bingo - Students played Bingo in both French and English with numbers up to ten. During September, students began to experiment and explore different sensory activities. 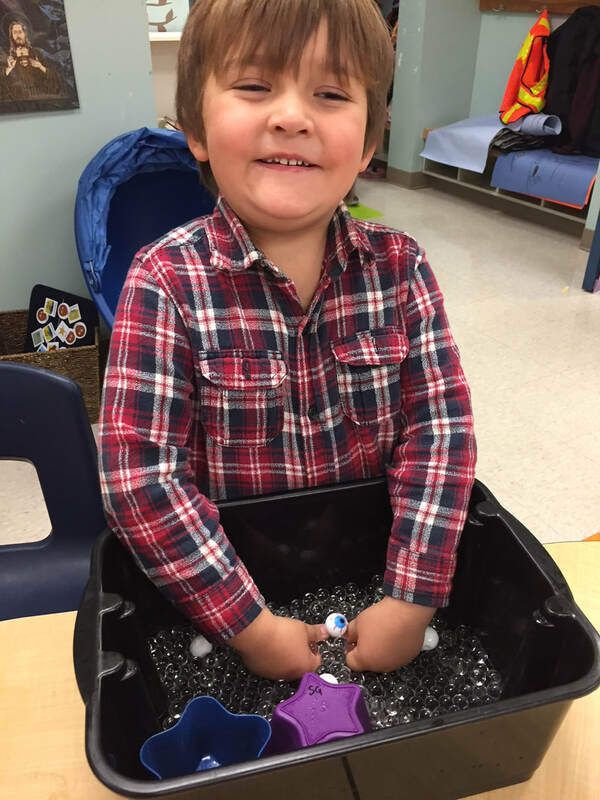 Students got to make playdough as well as play with it, explore Montessori trays, and play with water bins. 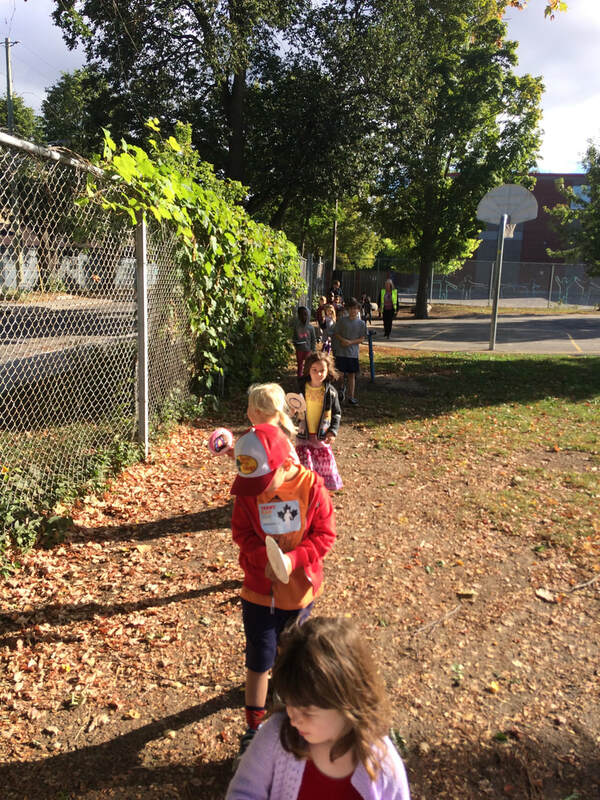 We have also begun to explore the changing season into Autumn, but still have lots to explore! 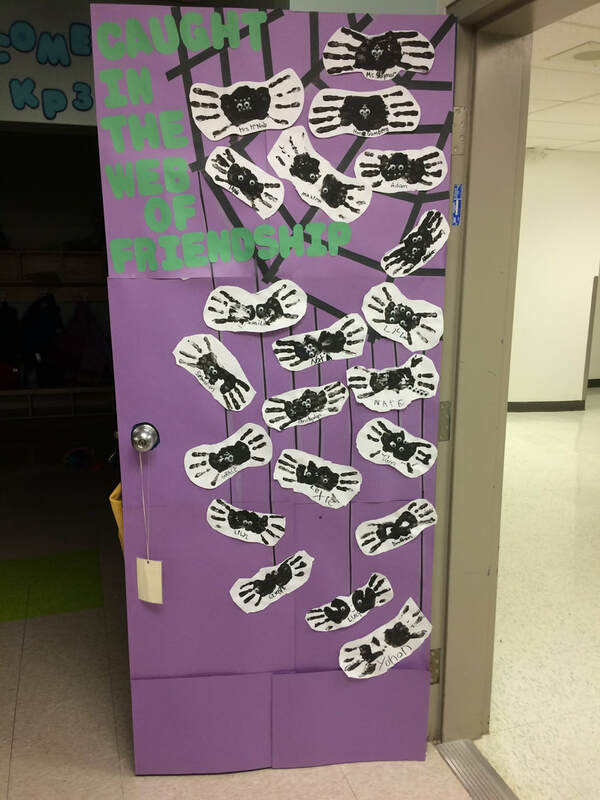 I Spy Letter Games - Each letter has a different ‘I Spy’ page and students would circle all of the pictures starting with that letter. Alphabet Matching - Students would match a letter on a popsicle stick with the letter found on the box. Alphabet Books - Students have the opportunity to colour and trace books that are specific to each letter. As a class, we have also been reading books (both as a group and independently) and attempting to start sounding out words. 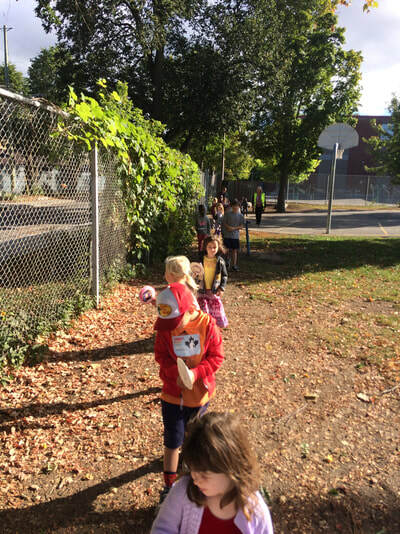 The students had a blast during the Terry Fox Run! 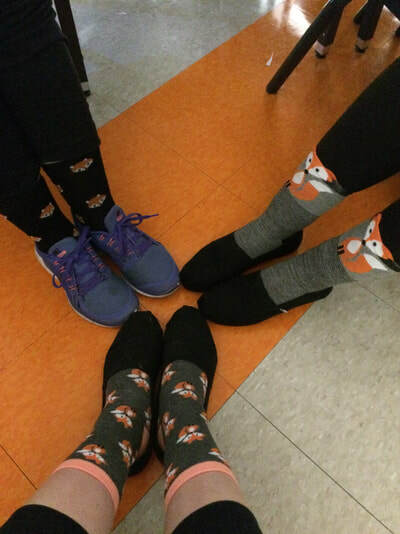 A lot of students wore their crazy socks, including Ms. Solymar, Mrs. McNab, and Mme. Gamberg! Thank you to those parents who came out to support us! 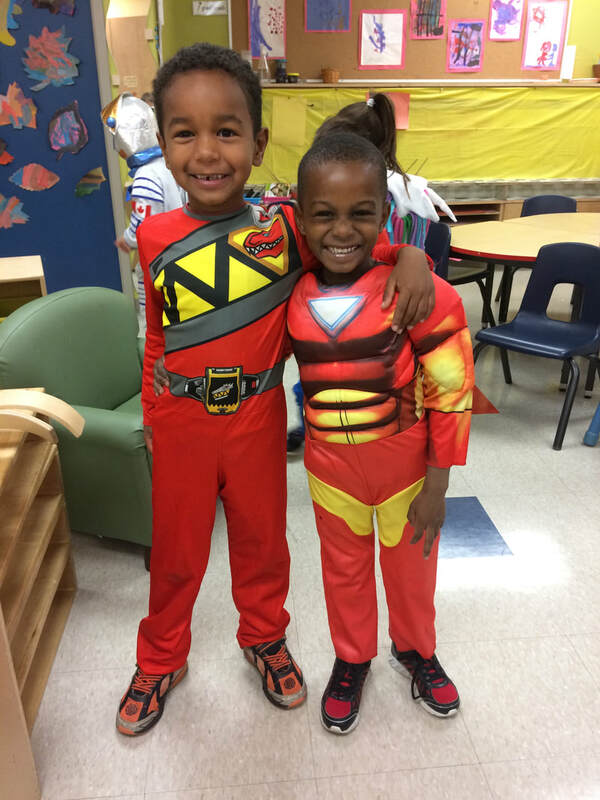 We think October is going to fly by just like September did! 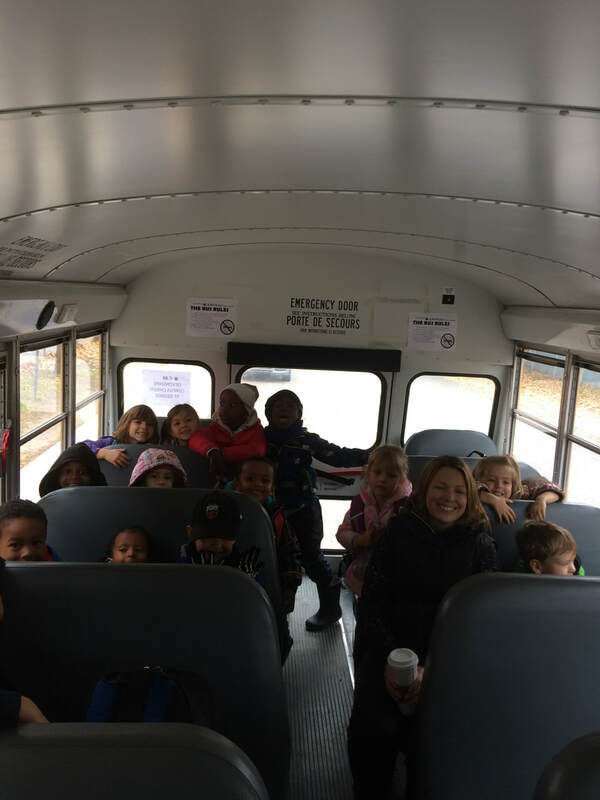 Especially with all of the fun activities that we have planned! 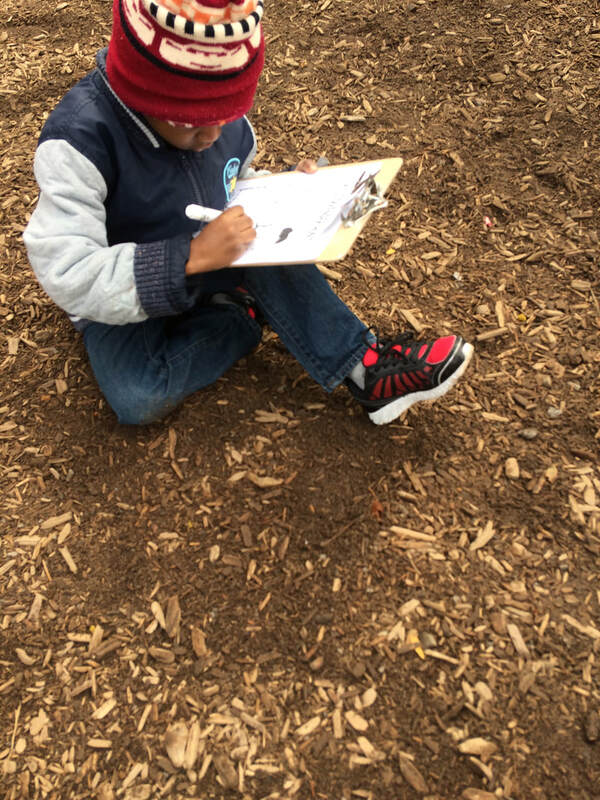 This week, the class has started writing in their own personal journals. In English, they write about their weekend. 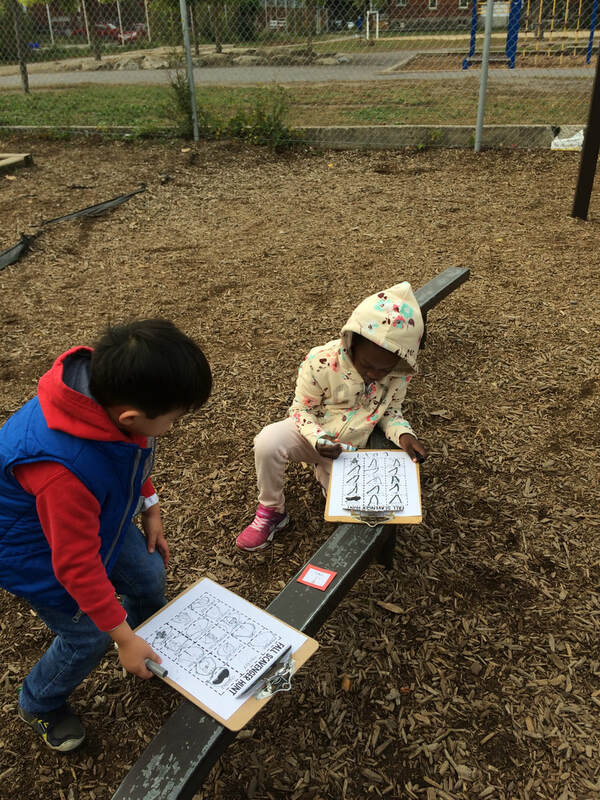 They start by drawing a picture and then work with Ms. Solymar or Mrs. McNab to write what they drew. In French, we are starting to work on letter sounds with songs and letter journals. 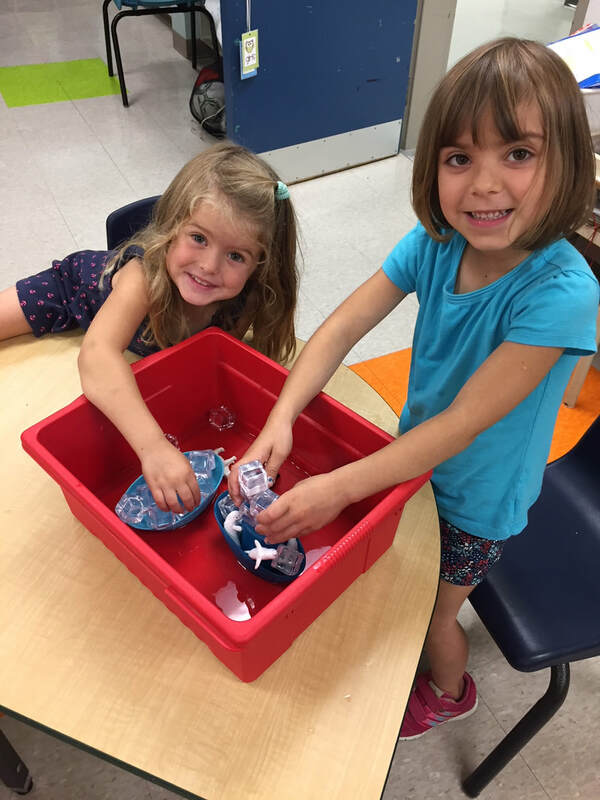 We will continue to work on learning our letters and numbers both through whole group activities and small inquiries during centers. 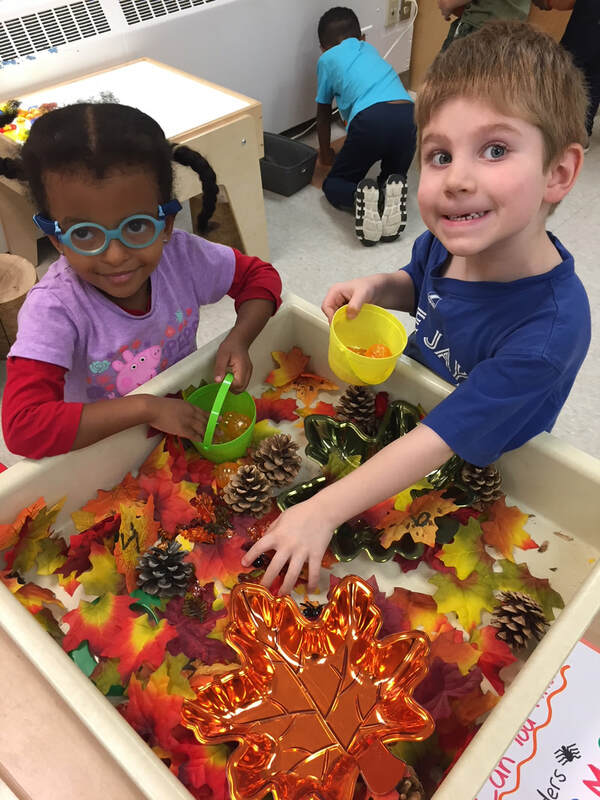 We will also continue with our learning about the season Autumn, and we are even making our dramatic play area into a ‘fall garden’! 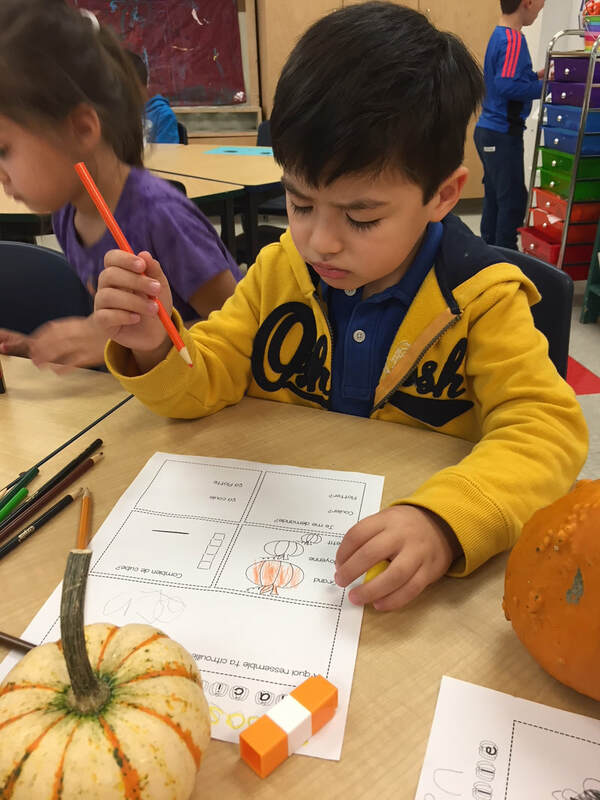 Thanksgiving and Halloween are the perfect opportunity to start to learn about celebrations and traditions that our own families have! We also have our first class birthdays coming up this month, so it will be exciting to see how birthdays will be made special in our classroom!